Ebooks are one of the most effective forms of new marketing. Ebooks have tremendous perceived value and therefore people tend to pass them on. They help solve problems and therefore buyers appreciate the content, branding the writer as someone worth doing business with. Many people have achieved business success by writing an ebook. So can you. 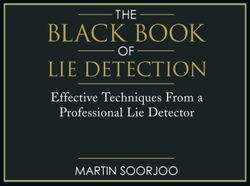 Martin Soorjoo sent me his latest ebook The Black Book of Lie Detection: Effective techniques from a professional lie detector. It is really well done and I hope Martin doesn't mind, but I am using his ebook as our example. 1. You should write about something that you know well. Martin is a Master Practitioner of Neuro-Linguistic Programming and expert in Body Language and has assisted individuals, companies and law enforcement officers in developing lie detection skills and detecting deception. Damn. He's credible! 2. You should write to solve a problem that people have. Martin's potential readers ask: How do I know if somebody is lying? 3. The ebook should be authored by a person. Don't make it by your company. You need the personal connection with readers. An ebook by "Premium Landscape Company" will not do as well as an ebook by "Mary Smith, chief landscape architect at Premium Landscape Company." 4. An ebook is a medium length document, maybe 20 to 30 pages. But since this is not dense text like a white paper, it is usually around 3,000 to 6,000 words. 6. Have a definite point of view. 7. Do not sell your products or services in the body of the ebook. 8. Write using conflict. Martin has a warning at the front of his ebook. And the content (is someone lying or not) drips with conflict. 9. At the end, in the biography section, have a place where people can learn more and can contact you if they want to work with you. 13. Lose control of the content by making it totally free with no registration required. You will have 20 to 50 times more downloads than if you require people to submit an email address to get the ebook. 14. Add a Creative Commons license to encourage people to share. 16. Tell people about the ebook, especially those in a position to talk it up. I am writing about Martin's ebook because he sent me the URL via a direct message on Twitter. 21. Use a header or footer with the title of the ebook with page numbers. (Sometimes people print out one page). What about the landing page? 23. Consider search engine optimization. The title tag for Martins's landing page is "How to tell if someone is lying – free lie detector ebook." I wouldn't be surprised if he gets to the front page on Google for the phrase "How to tell if someone is lying"
25. Add the first link to ebook above the fold on the top of the landing page. 28. Make the landing page a permalink with the URL part of the SEO term. I am concerned that Martin's URL www.communicationdownloads.com/Links.aspx is not a permanent link. 29. Make the inside design a little less font heavy. The font choice should add to the text. I'm not a fan of the various colors at the top of some of Martin's pages because I think it detracts from the writing. However, this is a personal observation. 30. How will you promote the ebook? How will people find it? A well done ebook has potential to generate hundreds of thousands (or even millions) of downloads. The New Rules of Viral Marketing: How word-of-mouse spreads your ideas for free my ebook that has been downloaded more than 600,000 times. (Do a search for the phrase "viral marketing" and see where the ebook come up). What did I miss in the tips? Do you have one to add? Have you written a great ebook? Congratulations! Go ahead and add the link in a comment and let us know about your success. How many downloads did it get? Can you tie the ebook to sales?